22 January 2016 Molly C.
Fourth in a series tracking my ancestor Arthur Bull’s family from the Catskills to the Adirondack foothills (1870-1875). 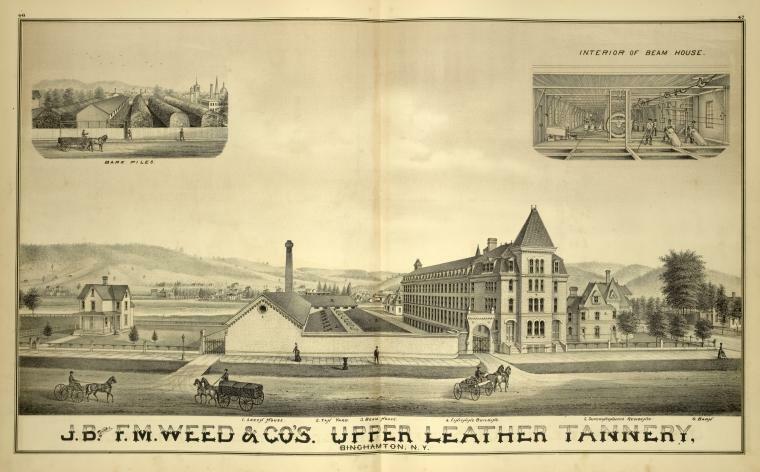 Some time between the 1874 marriage of his daughter Emma in Binghamton, Broome Co., N.Y., and the 1875 New York State census, my ancestor Arthur Bull once again relocated with his family — this time to New York’s Adirondack foothills for a tannery job in the state’s still-forested North Country. For on 23 June 1875, the state census taker found the family living in a new location — the combined First and Second Districts of the Town of Lyonsdale, Lewis County, N.Y. The Bull family’s odyssey to this new location was likely forced upon Arthur, as well as other tanners and their families, by dwindling downstate economic circumstances — possibly exacerbated by the industrialization of tanning, which put smaller shops out of business. When the easily accessible hemlock stands in the Catskills were exhausted, tanners looked to the Adirondack foothills for further supplies. 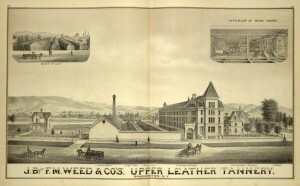 Here, water was plentiful, and the Erie Canal and emerging railroads facilitated the shipment of both hides and leather…In all areas, communities sprang up around the tanneries. My great, great grandmother Mary E. (Blakeslee) Bull must have had her hands full arranging for this move. This would be the furthest she and Arthur had strayed from their childhood homes in the Catskill Mountains — and according to the 1875 state census, they still had six minor children living at home: Carrie, 15, Milo, 13, Eva, 8, Jessie, 6, Frederick, 5, and William, 20 months. But the census also reveals that she and Arthur likely had help from family who moved north with them. Residing in the same household was their oldest daughter, Emma E. (Bull) Watson, 17, a housekeeper, and her husband Stephen Watson, 22, who also worked as a tanner. The Bull and Watson families lived together in a plank house valued at $400 (about $8,900 today) — a higher value than the homes of their neighbors, which seems to indicate that their change of venue was worthwhile. Nor were the Watsons the only relatives who joined them in the Adirondack foothills. As we will see in the next post, evidence indicates that Arthur’s parents — my great, great, great grandparents Mary and Jeremiah Bull — also relocated to Lewis County, N.Y., around the same time.